Prisoner profile: "Art has so much to do with daily life"
Hewa Wiremu (not his real name) has a love of the land and often paints places that he remembers as a child in rural New Zealand. 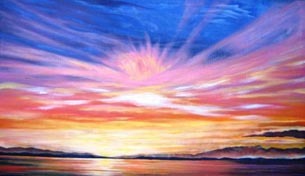 In his work, he often tries to capture the sublime colours of the sky â€“ particularly sunsets. Hewa is one of approximately 80 prisoners studying art from Corrections’ facilities around the country, using the distance-learning processes at The Learning Connexion. Sharon Hall, Restricted Programmes Co-ordinator and Distance Delivery Mentor at The Learning Connexion, says that Hewa is an active participant in any exhibition opportunity offered by The Learning Connexion, including its end-of-term exhibitions. “Taking part in exhibitions is about getting my art out there, clocking in, letting all the rest of the artists doing The Learning Connexion know I’m still here. It gives me self-esteem and self-worth,” Hewa says. 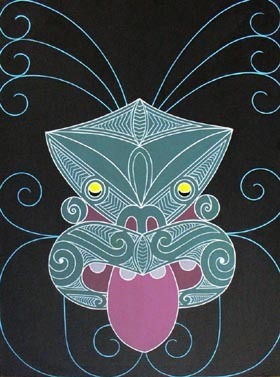 Sharon says that when he’s given the opportunity, Hewa is keen to discuss the meaning and stories connected with his work featuring more traditional MÄori motif. Hewa responded in writing to Sharon’s written questionnaire and his answers are unedited. I did MÄori carving and bone work. I couldn’t draw people or animals and then I started watching painters doing scenery. I was captivated straight away, and I started watching them and picking up little tips here and there. 2. What do you most enjoy about the course you’re doing with The Learning Connexion? I enjoy the feedback I get from my mentor, Jess. So encouraging, the words are for me. 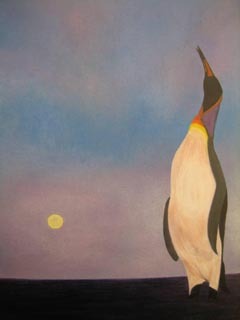 It makes me persevere when I’m having doubts about my painting. 3. Do you think it’s important to have good arts instruction and a mentoring process that supports the development of your art? It’s very important to have a good arts instructor and a mentor because they give you a different view of how I can look at my art and it's good to have someone that gives you appropriate feedback. Art has so much to do with daily life. If I’m having a bad day and I start drawing something all the frustration I felt earlier gets replaced with pleasant feelings, pleased with what I’ve just done, proud, cheerful and things that are positive. It also teaches you about solving problems and how to persevere. 5. Looking to the future, do you see yourself utilising the skills you have learned so far? I can see myself utilising all the skills I have learned so far because before you can go forward you must look back. In other words, sometimes when I’m doing a painting and I get stuck, I look back at my old works and then I say “okay”, this is where I need to go. By doing that, it also gives me the courage to help other people. Original generation time 2.7556 seconds. Cache Loaded in: 0.0004 seconds.